Is there any vegetable more Southern than okra? Is there any vegetable more funky than okra? Fuzzy on the outside, slimy on the inside, it can range from the ridiculous to the sublime. In Poppy’s opinion, boiled okra would be on lower end (slimy), but I can’t imagine gumbo without okra, both for its taste and as a thickening agent. Dipped in buttermilk then coated with a lightly seasoned flour-cornmeal mix it can be pan or deep-fried with excellent results. But if you are wanting to eat a little healthier (occasionally I do), then nothing beats roasted okra. Roasting (IMHO) improves the taste of most vegetables, and okra is no exception. What starts out as fuzzy and slimy ends up crunchy with a divine nutty flavor. Preheat your oven from 400° to 425°. 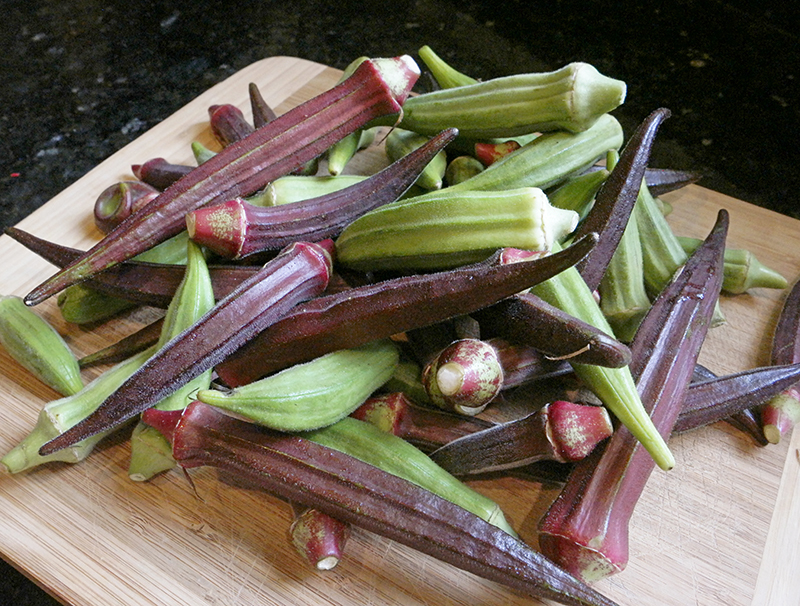 Slice the okra into 1/4″ to 3/8″ thick pieces, depending on your preferences and diameter of the pods. Toss the cut okra in a bowl with just enough EVOO to give it a slight coating. Arrange the slices cut-side-down on a foiled lined baking sheet wiped with a thin coating of EVOO. Expect to roast the okra for at least 30 minutes in a convection oven. I normally set a timer for 20 minutes, just to check on its progress. You can add some Panko crumbs or seasoned bread crumbs at this point if you want a little extra crunch, but lately I’ve skipped this part. If you’re ambitious, turn the slices for the final minutes of roasting. Once the okra has achieved a proper level of crispness and browning, remove from the oven. My favorite way to finish this dish off, is with a pinch of Cajun seasoning and a sprinkling of freshly grated parmesan cheese. By now you’ve noticed that something is missing from this post … a photo of the finished product! I’m going to blame my family for this error. It gets eaten before I can take a photo. My grandson in particular eats this stuff like popcorn, by the handful. If you get a chance to roast some okra and want to send me a photo of the finished dish, I would love to use your photo in this post.